I have been experiencing several serious-looking problems with my MacBook (OSX Yosemite 10.10.5, model MacBookPro10,1: Mid 2012 Retina, 16GB RAM, 768GB SSD) for a while now, the major of them being unable to restart, shutdown or log out normally. What happens is, after quitting every app, the system is left idling at the empty desktop — no icons, no menu bar, just the wallpaper. The mouse pointer is movable, Dock and Spotlight are still operating, but Finder is «Not Responding» and unable to relaunch in any way. So all I'm left with is a hard Power button reset or sudo shutdown -h now (another workaround is to click Restart with admin rights on the login window, I presume it's the same as the terminal command). All of these get fixed by a Mac restart, but keep steadily accumulating again. It's like the more time elapses after a restart, the more ruined and deteriorated the system becomes. For a positive note, this whole situation has taught me to do frequent Time Machine backups, but I would like to leave OS reinstallation as a last resort. (My drive is partitioned into two, with Windows 7 installed through Boot Camp, if that has significance.) I know that Yosemite is quite old, but I'm honestly scared of upgrading lest it becomes worse (performance loss, new glitches, feel free to reassure me). So, could anyone provide tips on what the root of this problem may be and how to fix it? Logs I should check, tests I can do, files to wipe or redact? Any advice is appreciated. Thank you, and safe travels! Interestingly, the computer seems to shut down properly from Safe Mode. Once again though, some window animations are extremely slow to render here, producing beautiful scrolling lines. I also tried shutting down in normal mode immediately after landing on the desktop after a restart, which works. So one can assume there is a software gimmick that is causing this problem shortly after startup. I created a new Standard (non-Admin) account as was suggested, and I think that helped to uncover the exact criminal in disguise — Finder. It seems like everything works nicely (while launching and switching apps), until the first Finder window is open (any folder), which somehow makes Finder unresponsive on shutdown, thereby freezing the latter. This happens on both user accounts. Interestingly, switching to another user and doing a «proper» shutdown (from Apple menu) before using Finder is working (although I guess the «blocked» user's session is still halted abruptly and incorrectly then). 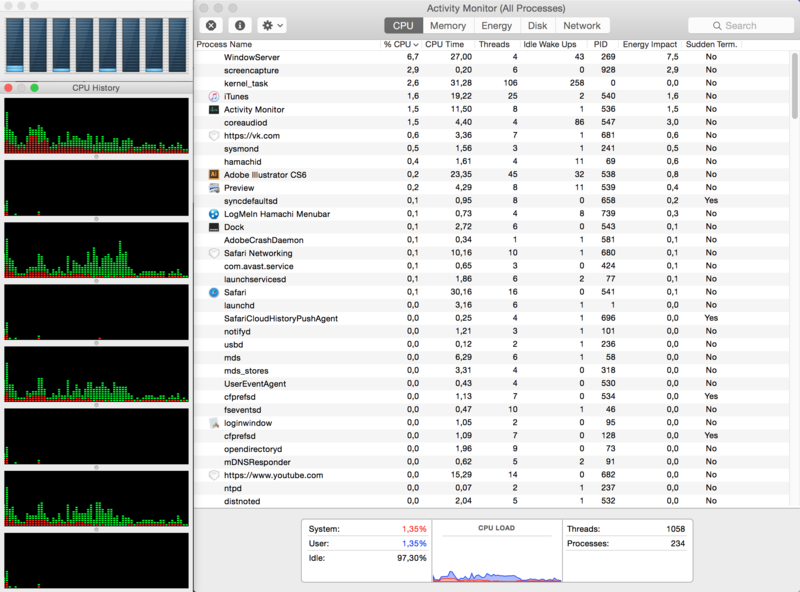 Now, the question is: what exactly is wrong with Finder, and how can I help the little guy? 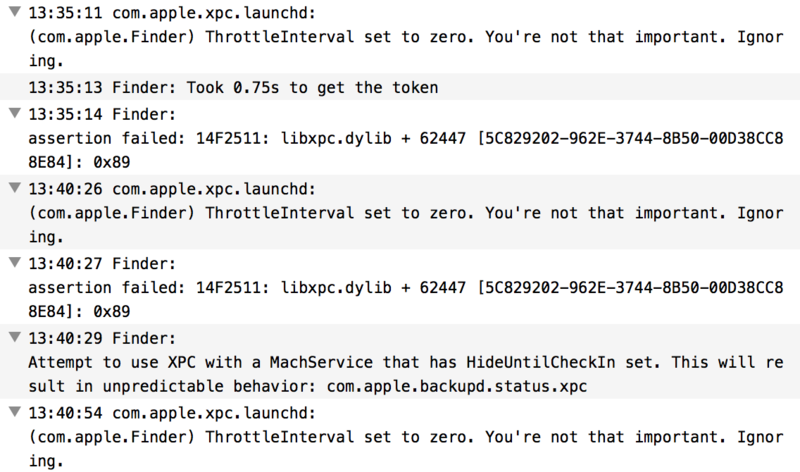 As suggested, I tried moving Finder cache and preference files to desktop through the Terminal while logged in as a different user, but this doesn't seem to affect the problem. (I do not know how significant these are; the Console spits out things like that from various processes regularly). I think installing new OS X is premature at this time and should remain as option. But it looks like you have problems with some 3D party apps. What is https //vk.com/ ? To test... Log in as Different user and see if it works to confirm my assumption. You can also run the EtreCheck to get a report on your system. And disable any app launching at start up in user profile log in items. To find out what the Finder is doing use following in Terminal. Login as your 'other' user. Log out as your 'other' user. Log in as shortname as usual. All of your Finder preferences will be reset to the defaults, but it might solve your problem. Not the answer you're looking for? Browse other questions tagged yosemite finder shutdown restart force-quit .